Betfair Exchange App is now available for NJ bettors who want to try out betting on horse racing. Read this article to find out more about the Betfair Exchange mobile app and which of its features are available in New Jersey. How To Download the Betfair Exchange App? Is There a Betfair Exchange App Bonus? Currently, there is no Betfair Exchange app for Android users in New Jersey. We are hoping to see this horse racing betting app available soon. On the other hand, there is the Betfair Exchange mobile app available for iOS devices. How to download the Betfair Exchange iOS app? Start betting on horse racing! Betfair also offers the Betfair Casino app, however, in this review, we are focusing more on the horse racing app. This horse race betting app is a good solution for mobile horse racing betting. Check back here for updates on whether Betfair Exchange will launch a Betfair Sportsbook app in the future. Since the Betfair Exchange Android app is not available, we are going to cover system requirements for the iOS version only. Since this operator is working with the TVG network, they are using similar promotions. You should know that you can use the Betfair Exchange welcome bonus through the mobile app as well as online. Deposit $200 and bet $200 to get $200 in bonus funds within 30 days of signing up. (T&C Apply, 21+ in NJ). Just remember to use the Betfair Exchange promo code during the registration process to claim this welcome bonus. There are some very good features available within the Betfair Exchange app. The Cash Out feature allows you to have more control over your bets. Cash out before a race is over if you see it not going your way. This is great if you want to bet on games while they are still happening. Betting during the race can be really fun if you enjoy these types of bets, and the action is sure to be exciting. 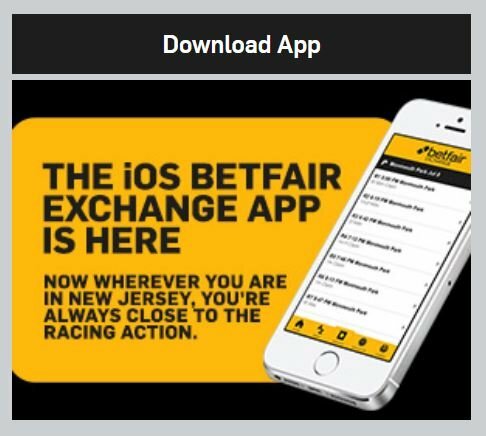 Find out more about the Betfair Exchange mobile app in our FAQ section. Get the answers to some common questions about this app. Simply browse through the horse racing events and select the one that you like the most. Choose the type of bet that you want to use and make sure to check the odds first. After that, you just need to choose the stake. By choosing the Deposit option in the account menu, you will need to decide which of the supported payment services you want to use. Make sure to read T&Cs for the payment service of your choice before making any transactions. Making a withdrawal is very similar to the way you deposit your funds. The process is pretty much the same. Just don’t forget to click on the Withdraw option instead of Deposit. We were really satisfied with the Betfair Exchange mobile app. Yet, there is a lot of room for improvement too. Check our table of pros and cons to figure out if this is the right betting app for you. We are hoping to see an Android version of the Betfair Exchange mobile app very soon as it would help them improve their user count. Check back here for updates when the Android app launches. Remember to use the Betfair Exchange promo code during the registration process to unlock their welcome bonus.